Sociology is inherently what makes Agile software development methods different from their predecessors. Other aspects of Agile such as pride of workmanship, craftsmanship, focus on quality, testing, highly iterative development, incremental small batch development, and a focus on human psychology were not new, many of these aspects of Agile dating back to the 1960s. The new element in 2001 was sociology - collaborative working in a high trust environment. This talk will explain how a deep understanding has been used to engineer the growth of the Kanban movement globally, and how different mechanisms in the Kanban Method can be used to increase social capital in the workplace with a significant economic, social and psychological payoff for both business and individuals that work within those businesses. You know implementing change is never easy and there never is a perfect time. Implementing Kanban at Winkle showed the opposite. With a good-spirited team, an old school Excel spreadsheet, an old whiteboard and some paper and magnets, we built our Kanban framework within a few weeks. Now, only 6 months later, the Kanban board is owned by the people working with it and it is showing major results. Find out more about our approach and results during our session. At least half of all agile software projects, and many other teams and projects in other industries, use Kanban boards or other techniques from Kanban, either alone or in conjunction with another method such as Scrum. We know from experience however that many implementations of the method fail to use the Kanban values, principles and practices to any depth – a large number do not even have a kanban system (a delivery flow system that limits work in progress with visual signals). Let’s not criticise people for shallow implementations of Kanban though. Protokanban systems provide some value to teams by making their work visible, even though their next steps are unclear. For the most part people are lacking simple and concise guidance on how to use this method. It’s time we acted to provide them with a guide into the essence of Kanban. 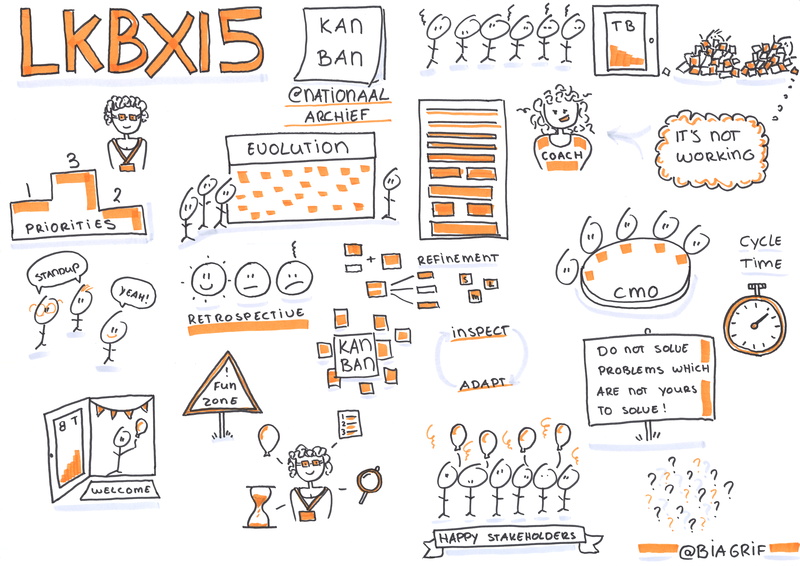 That’s what this session will introduce: Kanban- The Essential Guide. How to use Kanban to bring sanity to your PMO. Traditional PMOs are considered the motherships of project management disasters. Time and time again we encounter organisations struggling to cope under the pressure of a vast number of projects. *Balance the demand and capabilities of organisations to produce improved business flow. From DeafOps to DreamOps - how to keep decibel management to a minimum? A case study for a big insurance company who started their Agile journey with Kanban for 15 IT Hosting teams a few months ago. One of the major challenges was to make sure that the various clients and projects were able to access the various teams and be heard amongst them. Changes in priorities, collaboration and agreements were mostly not well thought of and this led to an increase in frustration by the teams. More work was started than finished, rework and missing deadlines were seen as “Business as usual”. During the presentation I will focus on the organisation of the different streams of work for the teams (which roles, how to organise), which means did we use to agree upon what is important and needs to be done first and the collaboration between the teams. Finally I will convey the lessons learned and the next steps in this client’s Agile journey. Exponential opportunities for innovation are a net generator for growth for the digital organization of tomorrow. Still, for most organizations today, the main challenge is how to integrate innovation in their DNA, let alone to manage exponential innovation opportunities. It is hard to resist the temptation to look at innovation as episodic and separate from daily operations. •	ensuring sufficient options to downstream processes. Looked upon as a whole, it provides a visual canvas to reflect on the critical aspects of change: learning, growing and delivering value to the customer. Retrospectives help teams to deploy agile practices in an effective way and to continuously learn and improve themselves. The retrospective facilitator (often the scrum master) should have a toolbox of retrospective exercises, and be able to pick the most effective one. This presentation explains the “why” and “what” of retrospectives and the business value and benefits that they can bring, and shows several exercises that you can use to facilitate retrospectives, supported with advice for introducing and improving retrospectives. Retrospectives are a great way for teams to improve their way of working, to become more agile and lean. Getting actions out of a retrospective that are doable, and getting them done helps teams to learn and improve continuously. Two years ago there was this team. A team of network and system administrators. With lots and lots and lots of work. And lots of chaos and stress. The only work finished was either the work from the people who screamed the loudest or the work from the people highest in rank. And then we introduced Kanban. This is a real life story about a Kanban implementation. How did we do it? What was the impact on the team and their stakeholders? And last but not least, what was the impact on management? With the success Spotify has with its way of working. Large organisations are adopting it. This means radically changing the way they work. Usually this implementation is Big Bang. Not only is this new for everybody here, it is a very large implementation as well. In this talk i'll go into detail about some of the more practical issues associated with this scale as well as what it is like to prepare the organization for radically new leadership behaviors, structures and team dynamics. This talk is based on experiences with large companies implementing the Spotify model. Service design in the digital era revolves around the customer experience. In order to meet the rising standards of the customer, it’s sensible to model & monitor their journey and understand the touchpoints with your organization. Organizations that acquire a good "outside-in" view are able to improve existing or come up with new business services that fit the persona and his/her customer journey. The business architecture of an organization should allow a smooth preparation, delivery and review of business services. The story mapping technique and its process fit well in these types of organizations. During this open space talk, I will elaborate on the process and relate the different practices to the risks we try to mitigate. How do you build a solar car? Okay and how do you win a race with a superlight solar car? We as agile coaches had no clue. Never the less we started helping out an engineering team to build their car from scratch in a year and win the most prestige’s solar race in Australia (http://www.worldsolarchallenge.org/). We want to share our experiences with coaching this team. We share what we have learned from coaching a vehicle building team instead of software. Most importantly, we learned couple of awesome things we would have never learned by only staying in the software teams. All we learned is directly applicable (back) to software teams. And of course, 'our' guys won the race! So how did scrum or we (as coaches) help? - How to apply agile in (hardware) engineering? - What difference does a tangible product make? - How did scrum made the difference? Featureban is a fun way for small groups to try out some basic visual management, and then experience the dramatic effect of adding work-in-progress limits to create working kanban systems. The Featureban game is applicable to all organisations dealing with knowledge work, such as engineering, software development companies but also a variety of service companies. *Featureban was created by Mike Burrows under creative commons licence. It was extended to upstream by Patrick Steyaert and Arlette Vercammen. LeanKit's founding team had a strong Lean-Agile background from previous careers. So, in the early days of the company, we just instinctively did things in a Lean way with as few formal processes as any startup. But, like any growing company, we eventually did have to start clearly defining how we do things. And like anyone, we were tempted to become more bureaucratic - with lots of scheduling, coordination, meetings and estimates. Instead, we developed our FSGD (Frequent Small Good Decoupled) approach. This LeanKit way of working has provided our teams with a simple yardstick for making effective decisions without a lot of cross team scheduling and coordination. It has simplified abstract Agile concepts into something everyone easily understands and cheerfully applies on a daily basis. FSGD isn't a replacement for Kanban, Scrum, XP, etc. We strongly believe in and spend lots of time teaching our teams about the Kanban Method as well as standard Lean and Agile principles, tools, and techniques. But FSGD distills what we think are the key decision making elements of those methods into something everyone can remember. We have seen significant improvements in our delivery speed across multiple teams since rolling out the FSGD approach. We'll share those results with the audience and help you get started learning to do what Fizz-Good.